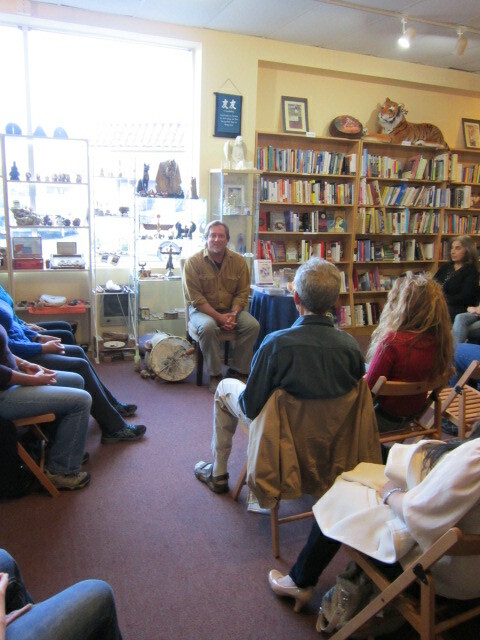 We had a wonderful turnout once again with more than 50 participants at my favorite bookstore and gift shop hear in Monterey, Ca. Emory and Mia Michael graciously host many events, and I’m fortunate to be invited each Solstice and Equinox to give a themed talk and journey/ceremony going on 4 years now. This Solstice was of course the beginning of the New Great Cycle, or Baktun, of the Mayan Long Count Calender. The talk and journey centered around the Medicine Wheel starting with Enlightenment in the South, the first step in beginning the journey to power and freedom. There we untangled and cleared the heavy threads of the past. Then we moved to the West, where we made ourselves available to leap, or take the first step towards new Opportunity. Then the North where we found the Courage to keep moving forward into the East where we surrender to Grace. We finished with a celebration of sounds from each Continent as we blew our prayers into a Palo Santo stick that I later burned in a sacred fire ceremony. Please enjoy and share this video of the event.